We tread softly behind our guide, taking care not to make the dry leaves crackle and alarm the birds around the Chambal Lodge estate. He points upwards, to a branch where owls are asleep (it’s mid-afternoon, and we’re surprised to see owls at all). A large Scops owl sits stock still, and stares at us with the cruel indifference of a CCTV camera. 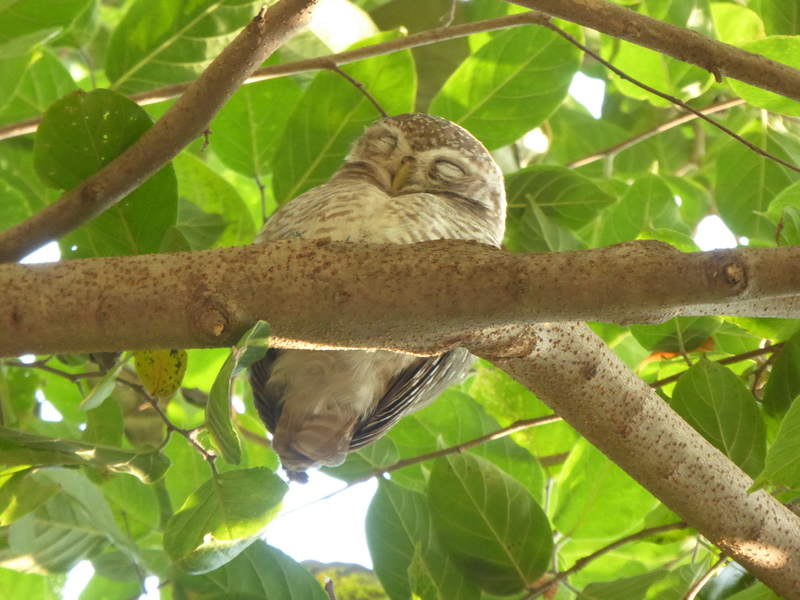 Nearby an owlet’s asleep, or pretending to be. In another tree fruit bats hang like black paper sacks, waiting for dusk before they stir and search for food. Other birds, unseen, call from inside the woodland cover. Our guide’s a naturalist with a special interest in birds. His eyes are ten times more acute than mine, and trained by experience to spot the species, gender and age of a bird from fifty yards. From time to time he hands us his old binoculars or points to a picture of the bird we can just make out in the distance, in his large Birds of India book. I can see he’s ticked the ones he’s seen locally: it’s a large proportion of the total. We pad past a termite nest. It looks like a miniature palace built of earth, with towers, gates and walls, but all the workers have finished for the day and it seems deserted. Then we’re led into a large field separating the wood from the long wall that encircles the village. Along the field edge is a different set of birds, some flocking like sparrows, other in pairs or solitary. A white egret stands alone in a field, unconcerned by the farmer working nearby. Other birds gather around the water irrigating part of his field. 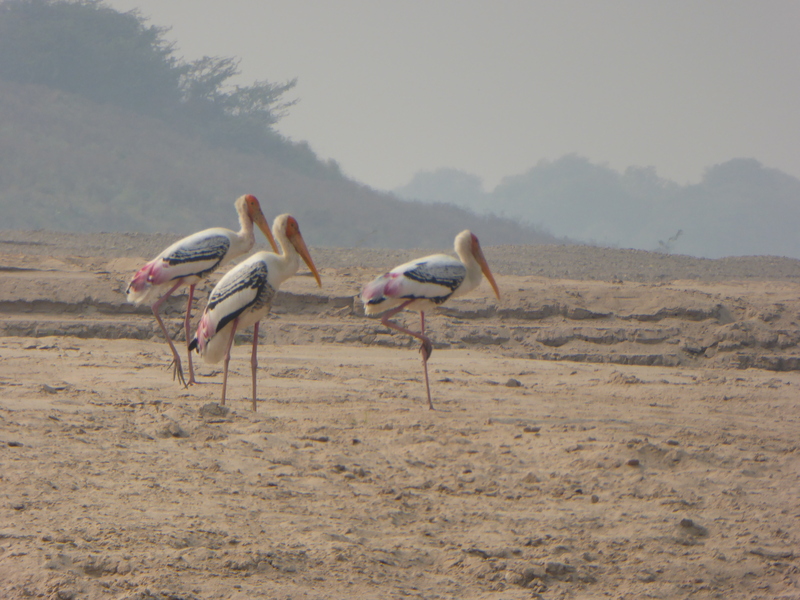 By the time we return, around five o’clock and the sun beginning to sink, we’ve spotted at least fifty or sixty of the bird species listed in the catalogue of Chambal birds we’ve been given. We turn a corner and at the end of a long path ahead of us stands a jungle cat, until he’s disturbed by another walker. Next day we set off by car for the Chambal river. Past small villages, rather tidier than the market towns we passed through to reach the Lodge yesterday from Agra, and then through desert land cut by what the locals call ‘ravines’, dry gulches lined with scrub. Eventually the river, slow, grey and wide, opens in front of us: it’s already travelled hundreds of (unpolluted) kilometres from western Madhya Pradesh before we see it. We’re in the National Chambal Sanctuary, a 400 kilometre stretch of the river and its shores. Two boats are waiting, each with a pilot. We board one of them and head slowly up river, our naturalist guide’s binoculars already scanning the banks. The banks are of bare, brown earth, in parts steep-sided with some sporadic foliage. A few people are dotted about them, cutting firewood, carrying loads, guiding cattle along the waterside. The river, like the air, is completely still, its surface broken only occasionally by fish or, once, a freshwater dolphin. Within minutes the bird count has risen to ten, then twenty. The opposite bank then looks more promising and the boat flits there to search for more birds. The motor shuts down and we wait in silence for things to happen. Further upriver we’re joined by other, reptilian company. A turtle stands on a small bank, its feet planted foursquare as the river flow past, like a soprano on stage in full, but silent voice. A crocodile lies motionless on a low mud bank. As we approach it stares at us with its unblinking eye, slides itself gradually (but with a hint of being able to move faster should the need arise) into the opaque water, and disappears. Later we come across a group of crocodiles, completely still, by the water’s edge, and, on its own, a tiny baby crocodile scans the surface of the river. But there’s another menacing reptile here too, the gharial. Roughly as large as the crocodile, it reminds me of one the concrete dinosaurs in Crystal Palace Park. Gharials were almost extinct before the Sanctuary was founded in 1979. By the time we’ve finished our river journey we’ll have seen dozens of different species across two days. Among the birds alone we’ve spotted grebes, geese, shelduck, moorhens, drongos, mynas, sand martins, bulbuls, babblers, wagtails, white-tailed lapwings, woodpeckers, hornbills, hoopoe, Indian cuckoos, parakeets, swifts, black ibis, pied flycatchers, storks and many others. It’s hard not to be struck by the sheer abundance of the natural life of this part of rural India. India has its environmental challenges – only the week before we arrived there Delhi was enveloped in a dense, unhealthy smog – but it’s large and diverse enough that humans can share the space with many other forms of life. Coming back to Britain it’s equally hard not to reflect on a very different balance between man and the rest of nature here. The Joint Nature Conservation Committee’s latest biodiversity indicators (2017) show deterioration across many areas: wetland, farmland and woodland birds, insects and ‘priority species’. According to the State of Nature report published in 2016, 53% of 8,000 UK wildlife species tested are in decline, and 15% face extinction. We’re likely to become one of the most ‘nature depleted’ countries on earth, unless climate change can be slowed, agricultural practices changed, and less land lost to nature.